When preparing to farewell a loved one, there’s a desire for the occasion to be marked not entirely by sadness, but with warmth, love and light. Our venue has been designed with these values in mind, to ensure your loved one’s Celebration of Life is the very best it can be. We take as much of the organizational stress off you and your family as possible during this difficult time, while also remaining sensitive to budget concerns. We’re here to support you throughout the day as much as we can, from floral arrangements to audio visual equipment required for slideshows, music, eulogies and speeches. We also encourage personal touches to truly and authentically represent the spirit of the departed. Our team offers multiple packages to tailor each venue, service and menu for family traditions. We also understand that sometimes our loved ones can leave us quite suddenly, which doesn’t give the family the benefit of time for organization. At Celebrations on the River, short lead times aren’t a problem. Should your desired venue be available on the desired day, we can be ready to host you and your loved ones immediately – no mess, no fuss and rest assured, you will be well looked after If your desired room isn’t free, we’ll be happy to show you through rooms that are available and work with you to craft the most special memorial. Our venue is tastefully decorated, warmly lit and equipped for a wide range of video and audio file formats should your family wish to screen a family movie or slideshow, or play music during the service. We offer on-site catering as well as a full service private bar. The celebration of life service should mirror the uniqueness of each life lived. We want to help you plan a ceremony that is reflective of those memories, spirit, and the life of your loved one. Our goal is to enhance your celebration of life. We appreciate that organizing a funeral reception or celebration of life can only add to the stress of losing a loved one, so our team of friendly and compassionate event planners will be on hand to take extra care of everything you need – before, during and after the day, leaving you safe in the knowledge everything is taken care of. Full service drink menu with exceptional service. Choose from a cash bar, open bar, or anything in between…it’s all yours. Simple and transparent pricing makes paying for your loved one’s celebration of life event easy. 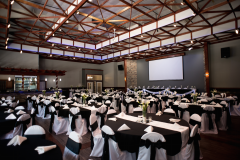 We’ll make it easy to price your event, consisting of room rental fees, food, drinks and décor. Located just two blocks off I-90, we are centrally located in La Crosse, WI. Easy access coming from downtown or out of town with plenty of free parking. For more information, call (608) 783-3335, email us or submit your inquiry online.